This offseason I figured the Giants would formulate a Buster Posey-type plan for Brandon Belt: spend two months mashing in AAA, build some confidence after a rocket ascent through the organization in 2010, then come up to the club in early summer, provide a jolt to the offense, and get himself in the conversation for Rookie of the Year. Belt, I thought, would provide another great contrast with a young Braves star (first baseman Freddie Freeman). Just as Posey and Jason Heyward chased the hardware together last year, Belt and Freeman seemed destined to be intertwined in 2011 . While Freeman has had a great season (after a slow start), no such luck for Belt. Grant Bisbee wrote an excellent article contrasting the players and the organizational philosophies that have driven the fates of their 2011 seasons. I don’t want to replicate that so I’ll offer another counterpoint to the Giants approach with Belt. 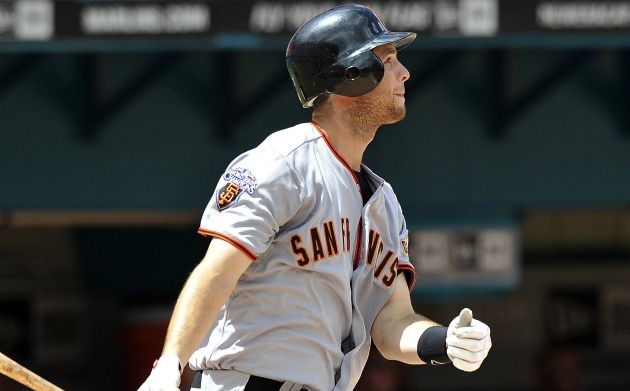 In 2007 the Boston Red Sox made an all-out organizational commitment to Dustin Pedroia, the likes of which I have never seen the Giants make with a position player. Pedroia got his first call up in late August 2006 and finished his six-week stint with 2 home runs, a .191 average, .258 on base percentage, while slugging .303. Not great at all. Good enough, though, for Theo Epstein and the Sox to name him their starting 2B for 2007. They elected not to resign Mark Loretta, and really only had Alex Cora as a back up. He rewarded them with an April line of .182/.308/.236 with 0 HR and only 2 RBI. Red Sox nation was up in arms. “Get rid of the kid, he’s not ready, he’s too small, etc!” After going 0 for 3 on May 1st, his average dipped to .172. After that there was no looking back. By the end of May he was up to .308/.394/.433. He finished the year .317/.380/.442 wining the ROY and then helped the Red Sox win the World Series. The next year he was voted the AL MVP. NO ONE, and I mean NO ONE, in Boston has any question about Dustin Pedroia at this point. He is the most loved player on the team and it’s not really close. Now, the Belt situation is a little different. Pedroia was a high draft pick. He was one of Theo’s pets from one of his first drafts. The 2006 Red Sox missed the playoffs. There was no pressure to bring back a veteran that had just helped them win (ala Aubrey Huff). The team had a lot invested in “the laser show” and they had the patience and commitment to ride out his early struggles. The problem, for me, is that the Giants have never done this with anyone, not even with Posey. Not everyone should get the long leash the Red Sox gave Pedroia or that the Braves have given Freeman. But I’d love to see the Giants do it with someone at least once. For now, we can only hope Belt stays hot, not just for the sake of the team, but also for his personal development. The dude needs to play!